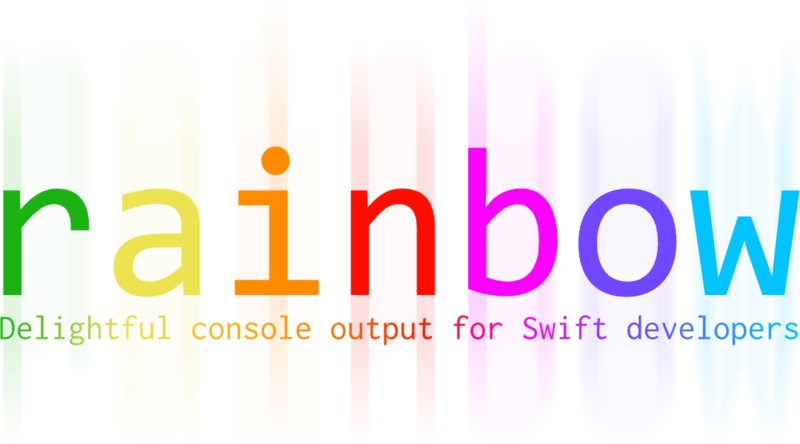 Rainbow adds text color, background color and style for console and command line output in Swift. It is born for cross platform software logging in terminals, working in both Apple's platforms and Linux. let output = "The quick brown fox jumps over the lazy dog"
Thanks to the open source of Swift, developers now could write cross platform programs with the same language. And I believe the command line software would be the next great platform for Swift. Colorful and well organized output always helps us to understand what happens. It is really a necessary utility to create wonderful software. 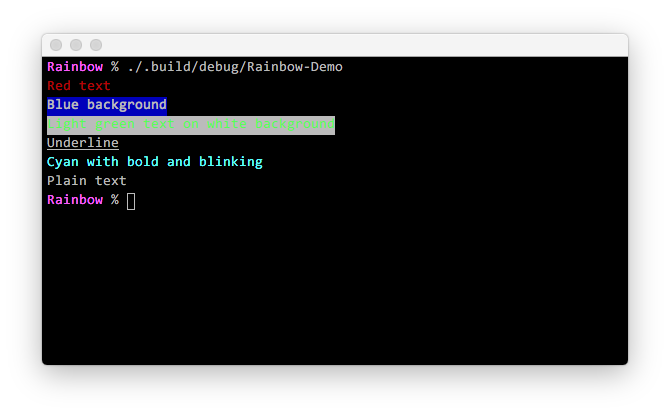 Rainbow should work well in both OS X and Linux terminals. It is smart enough to check whether the output is connected to a valid text terminal or not, to decide the log should be modified or not. This could be useful when you want to send your log to a file instead to console. Although Rainbow is first designed for console output in terminals, you could use it in Xcode with XcodeColors plugin installed too. It will enable color output for better debugging experience in Xcode. Please notice, after Xcode 8, third party plugins in bundle (like XcodeColors) is not supported anymore. See this. Rainbow 3.x supports from Swift 4. If you need to use Rainbow in Swift 3, use Rainbow 2.1 instead. You could know more information on how to use Swift Package Manager in Apple's official page. And you need to import RainbowSwift instead of Rainbow if you install it from CocoaPods. Carthage is a decentralized dependency manager for Cocoa application. Run carthage update to build the framework and drag the built Rainbow.framework into your Xcode project (as well as embed it in your target if necessary). Follow and contact me on Twitter or Sina Weibo. If you find an issue, just open a ticket on it. Pull requests are warmly welcome as well. Rainbow is released under the MIT license. See LICENSE for details. Expose Rainbow. extractModes as public.